I have been back in seventh heaven in November. 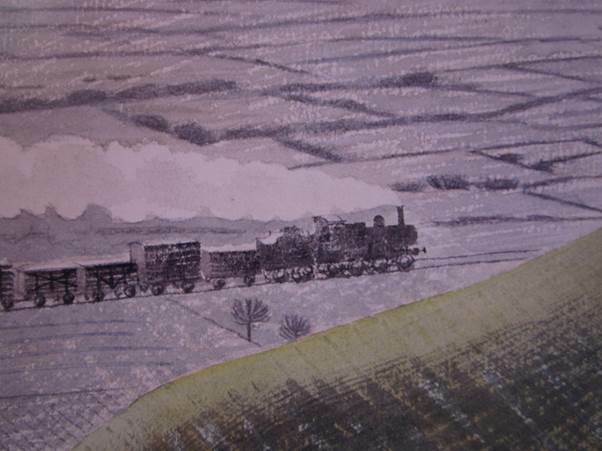 My Eric Ravilious calendar has been showing me a chalk downland scene and one I am very familiar with. This is not the much loved Sussex of my childhood. This is the equally loved Wiltshire of my adult life. 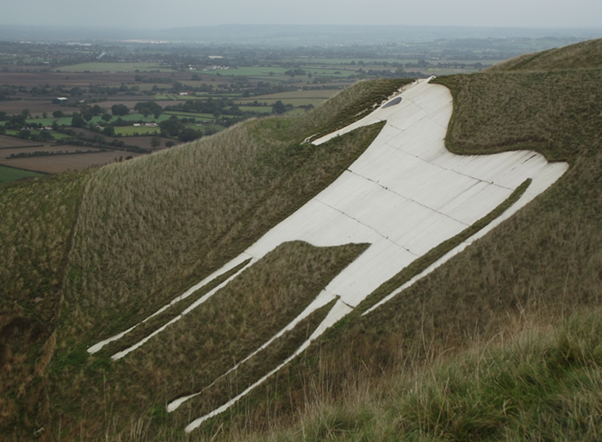 And I was last at the Westbury White Horse on October 1st when I took this picture. 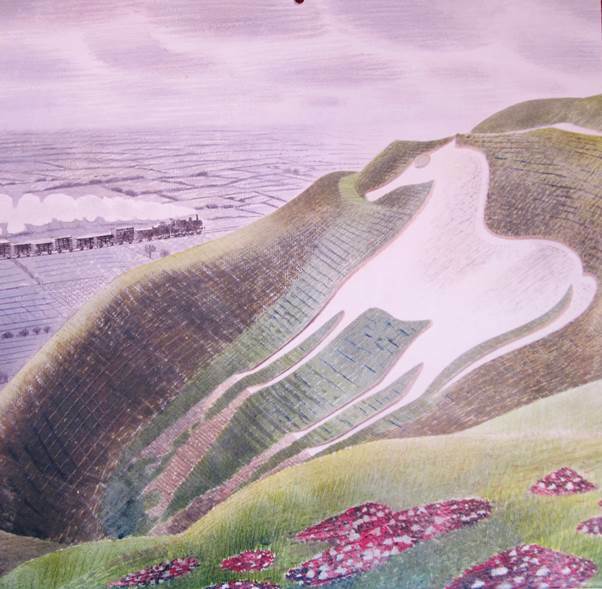 What has changed since 1939, when Eric produced his painting, is that the horse has been concreted and painted. You no longer get the chalky streaks flowing off the hooves in rainy weather. Of course, the trains have changed as well. From this viewpoint, but not where Eric has put his train, I managed to get two of the present day trains. 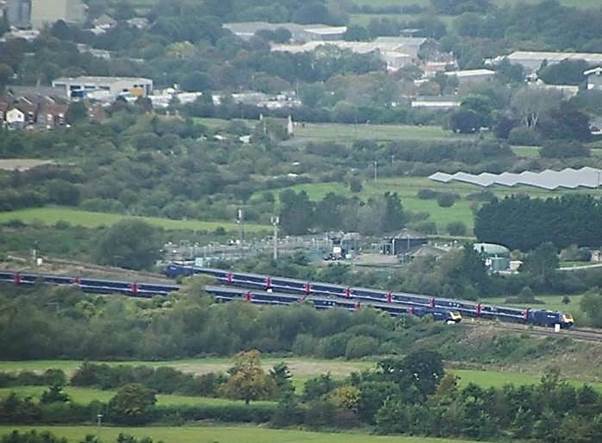 These are nearer in to Westbury. I wanted a closer look at Eric’s train. I should say that loco is stylised. It doesn’t look to be anything I’d have expected the Great Western Railway to have been operating in 1939. But it looks the part as it works hard with its mixed goods train. 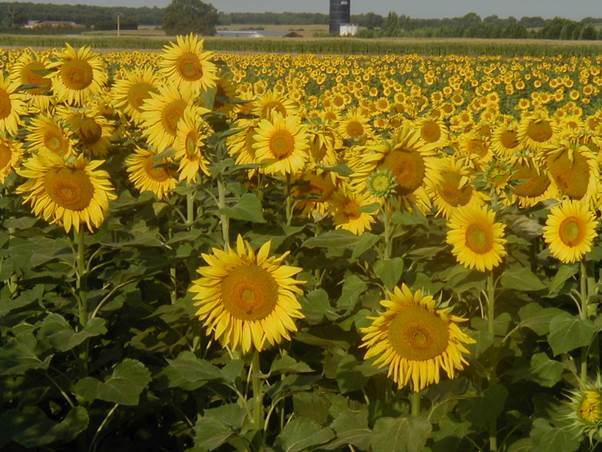 Yesterday I aimed to cheer up the drab end of November with summer sunflowers. They were cultivated and in France. 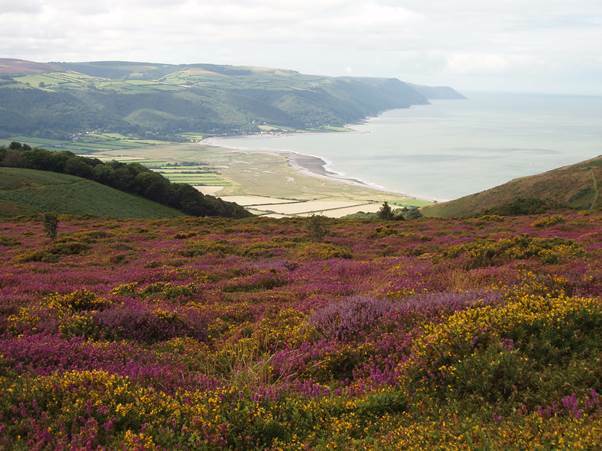 Today we’ll look at wild flowers in the UK – on Selworthy Beacon, Exmoor, to be precise. I’m guessing this smile bringing collection is pinky purple heather mixed with bright yellow gorse. I think it looks great. 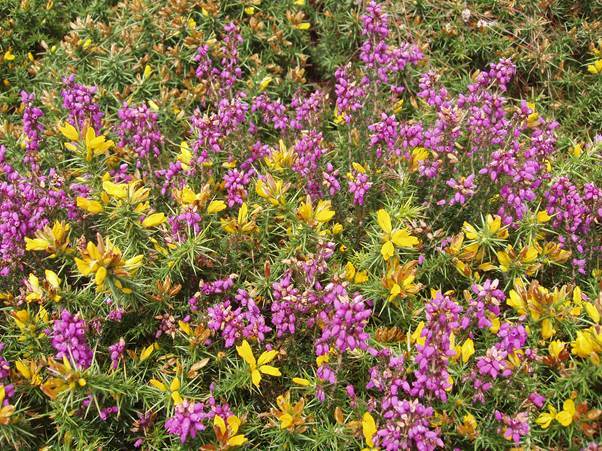 There are acres of this heather mixture, high above the coast. That’s the view down to Porlock Bay. We were at this lovely location in a somewhat damp and chilly august in 2008. 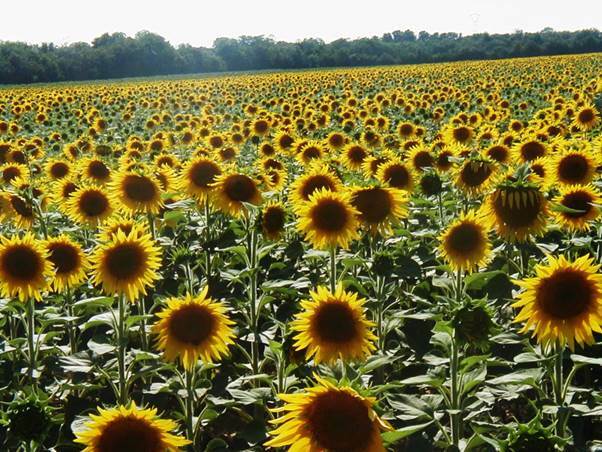 I don’t think sunflowers were grown as a crop in the UK in my youth although I do see them now. And they do raise a smile when in bloom for they are such bright and cheerful plants. The summer of 2003 was the very hot year. Perhaps it was a mistake to head south in France that summer and in the end we broke with our traditions. We found a campsite with a swimming pool and decided that was just what was needed, but we did tour around quite a bit as well. This photo was taken before we had gone all that far south. It was about 50 kilometres from the Atlantic coast near La Rochelle. It has to bring a smile to the face – particularly now (as I write) in late November. This field, on the same holiday, was at Villefagnan. That’s some 60 kilometres south east of the previous field. Just lovely, and no doubt oil is extracted from the seeds. Nearly all of my childhood was spent about a mile from the route of the London to Brighton veteran car rally; This offered us free entertainment on the first Sunday in November as the ancient cars trundled down to the Sussex coast. Photographs certainly weren’t taken all that often, but in 1958 my dad took a few of which this is about the sharpest and clearest. 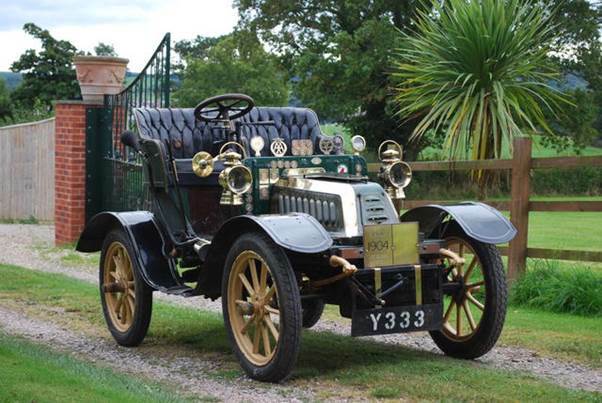 The car is a 1904 De Dion Bouton – a two seater with a six horsepower engine. It was 54 years old at the time. My feel is that the overtaking car is a Humber but someone will let me know if I’m wrong. As this was taken in 1958, that car is now (if perchance it survives) at least 56 years old – so older than the De Dion was then. I have commented on my liking for the browsability of encyclopaedia in book form but identifying the old car was a simple job for the web and we find that auctioneers Bonhams sold the very same care in 2009 (for close on £70000). This image of the same car – reverted to an original registration – comes from their gallery. We have a habit of going to wilder parts of the UK for holidays. Cornwall often features. It isn’t that far from home, it is utterly beautiful, has a north and south coast only a few miles apart but often with quite different weather and if it is bad we can do a spot of genealogy for my wife has Cornish blood in her. On one occasion, many years ago, we stopped for a stroll on Bodmin Moor. It was very misty – almost heavy enough to call it drizzle. The ground under foot was very wet and giant slugs were out in force. We stopped to ‘admire’ one of those big orange ones. At this point a fellow traveller loomed out of the mist and stopped. It turned out she was an American lady. ‘Gee! This is so authentic’, she declared. For a while we didn’t know if she meant the slug or the weather but we deemed it was probably the weather. I surmise that she might have been a Daphne Du Maurier fan. We weren’t all that far from Jamaica Inn. But that phrase of authentic weather (or slugs) has stuck with us. I note in my diary for August 12th 2004 that I described the weather as authentic. Mind you, this wasn’t in Cornwall by a long shot. 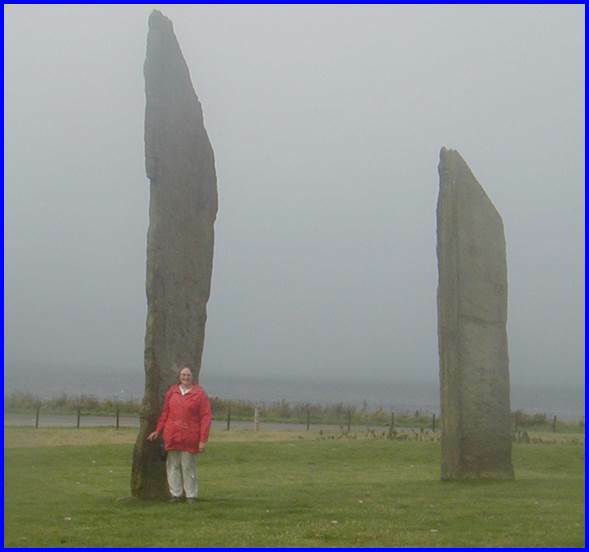 This was on the wonderful Orkney Islands. We were looking at some of the ancient standing stones. 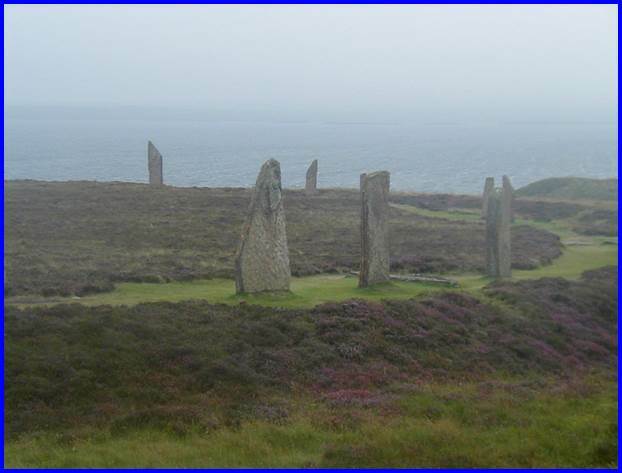 This is a part of the Ring of Brodgar. It probably dates from around 2000BC so is around 4000 or more years old. 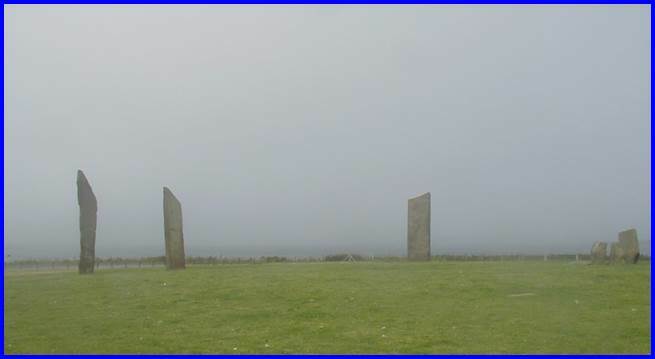 The photo makes it clear that it was a tad misty – perfect authentic weather for this kind of place. It was still very authentic! This monument is at least 5000 years old and needs a person in it to give it some scale. Yes, that’s a mighty stone. 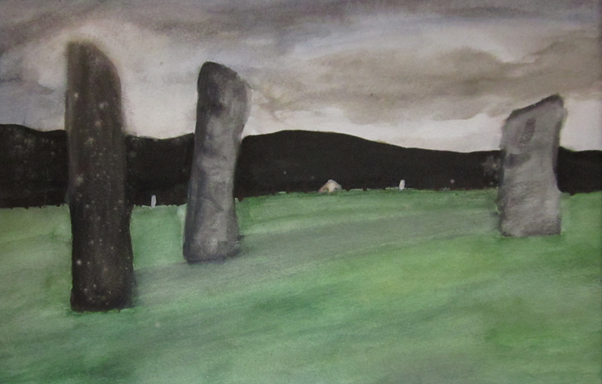 This is another monument where we have an improved image painted by our daughter. She’s able to make it seem less misty but it still retains an authentic look. I love the internet. It is oh so brilliant when you want information. I love it for helping me identify plants, birds, butterflies and so on. It is just great that you can look up just about anything and be just about certain of finding what you want. These days I’d hate to be without it. Yes, there is a but! Some might not regard it as a serious drawback but I see paper books as having an advantage. A web encyclopaedia, like the one we all use (Wikipedia) may work hard at making links from one area to another but by and large the links are ignored. People using on line encyclopaedia really have to know what they are looking for. They don’t provide the page turning opportunity of a real book. The on-liners are a bit like Sat-nav. They get you efficiently to a destination but don’t offer the opportunity to be truly inspired by the journey. 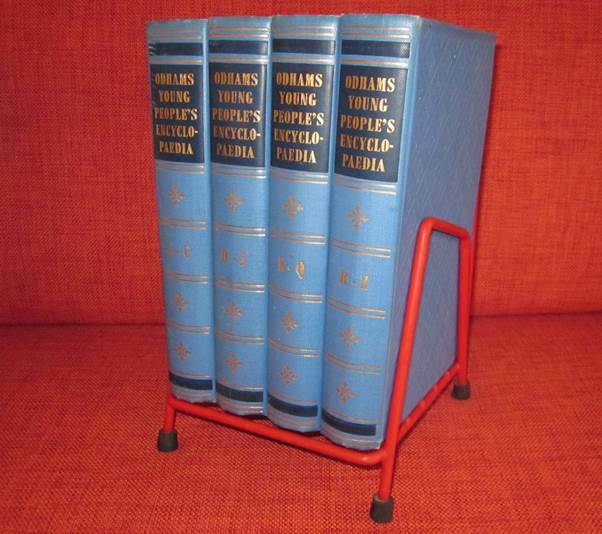 I remain eternally grateful to parents and grandparents because one year they provided for me the Odhams Young People’s Encyclopaedia. This set was published in 1958 and I reckon it was 1958 when I was given them. They probably had coloured dust jackets, but if so, I don’t remember them. Even without them, they are quite a tight fit in the purpose made stand. If dust covers existed they are bound to have got damaged. The great thing with a book is that you can browse, or just read from cover to cover, as well as look things up alphabetically. I was able to absorb information about things I may not have been specifically interested in. 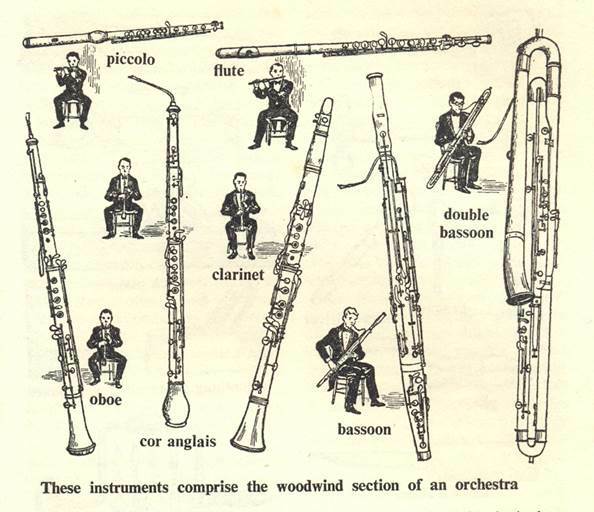 How did I learn about woodwind instruments? Why, from the encyclopaedia of course. 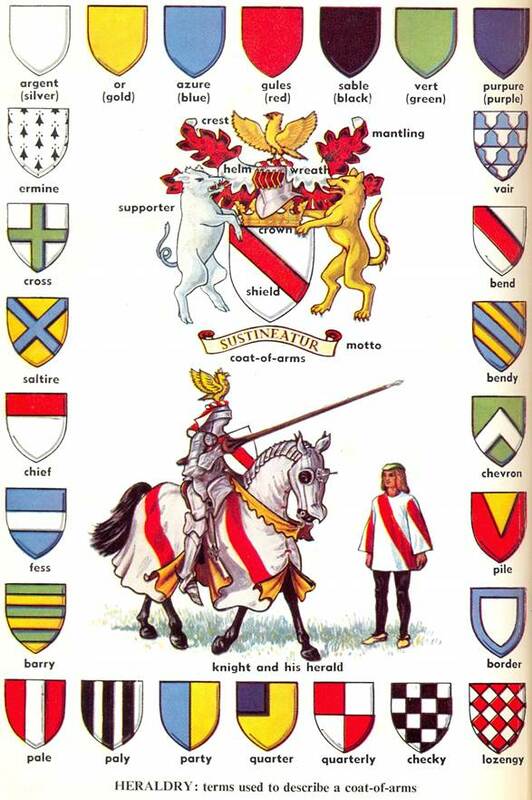 And heraldry? Yes, the encyclopaedia again. Of course, the books have plenty of text but line drawings, like those musical instruments are found on just about every page. There are plenty of black and white photos and a goodly sprinkling of colour plates. It was a great gift in 1958 – and still appreciated today. One of the sounds of childhood for me was the slightly scary hiss of escaping steam from the pressure cooker. My parents believed in the pressure cooker. By making the water boil at a higher temperature, cooking times for all sorts could be seriously reduced so it was a real economy. That mattered when money was in short supply. But also, a pressure cooker was large and could have containers within it. A range of different items could be cooked on a single stove and that saved even more money. Stews, puddings, vegetables could all be cooked to perfection in the hissing monster. I recall, with particular affection, my mum’s bacon roly-poly. This was a suet based dish with bacon spread thinly through it. It must have been as cheap as possible, but oh so warming, nourishing and tasty. 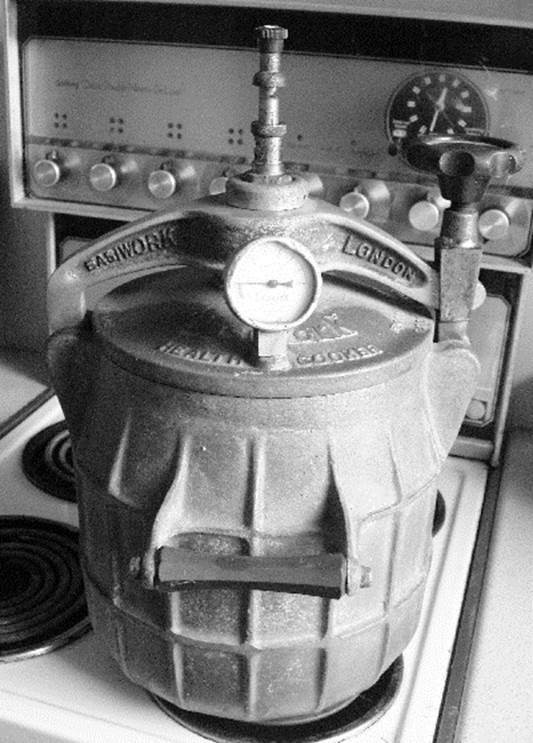 The pressure cooker I remember was this one. This posed photo shows it sitting on the electric cooker we used until a couple of years ago. It’s an Easiwork of London Health Cooker and probably dates from about 1930. We no longer actually use this device. I should add that this device always came camping with us. My mum had but a single primus stove with which to cater for a family of five plus visitors. So the hiss of the bomb (as we all called it) was even a holiday sound as well. A pressure cooker is still used in my household. It comes into its own, particularly, for Christmas puddings. Ditchling is a village in Sussex. This is a scene I remember well from my own childhood although this card was sent nearly forty years before I was born. 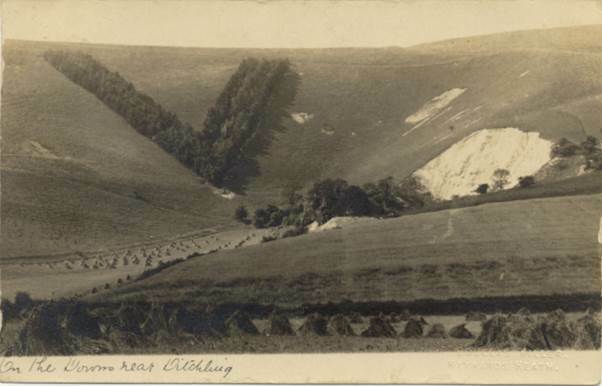 It shopws the V shaped plantation of trees on Ditchling Beacon. They were planted in 1887 to mark the Golden Jubilee of the queen. Hence the V for Victoria. This mark was something we looked out for on our journeys to and from camp. I daresay we sometimes saw corn stooks in the fields below the V as well. 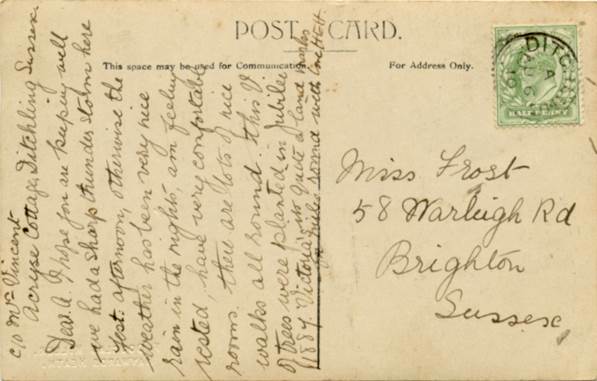 The card was sent to a Miss Frost, just over the downs in Brighton. I have no doubt that Miss Frost was a relative of mine – this card was in the possession of my grandmother. But I haven’t identified just which Miss Frost this was. Her initial appears to be ‘A’. 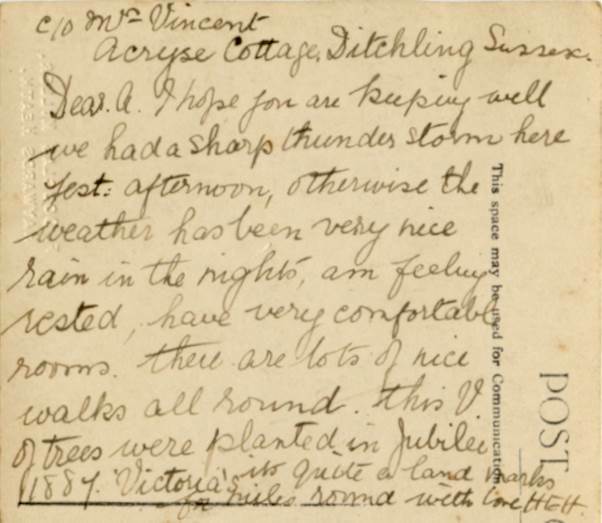 Miss A Frost was obviously at 58 Warleigh Road in 1910. Unfortunately, she wasn’t there in 1911 for the census. Her identity remains a mystery to me. So, too, does HGH who sent the card. When I attended a recent school reunion, for former pupils at Hazelwick School in Crawley, Sussex, I had forgotten that I had a piece of memorabilia which might have interested others. I saw myself as a bit of a low profile student. I wasn’t an actor although I did odd technical bits for plays. I wasn’t a musician, except in my out of school band in which I was the drummer. I wasn’t really a sports player. But then I came upon my first ever table tennis trophy which was won as a representative of Hazelwick. 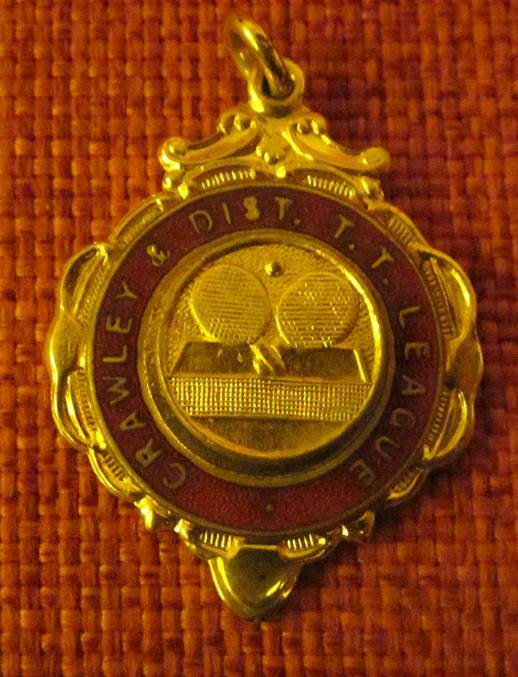 As we can see, I was playing in the Crawley and District Table Tennis League. The reverse of this medallion carries the information about why I won this. 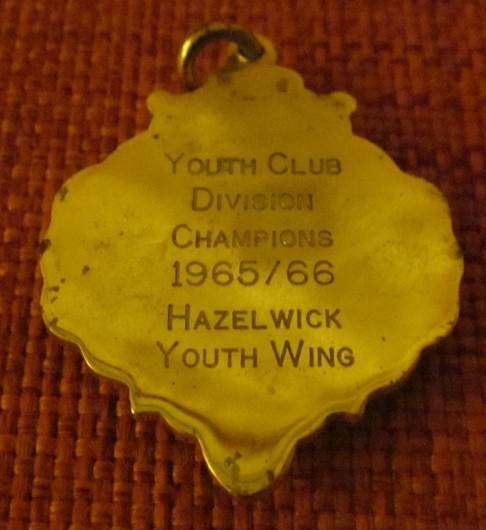 Yes, the Hazelwick Youth Wing (very much a part of the school) were youth club division champions for the 1965/66 season. I was a regular player that year and we were proud to carry off the trophy. For the record, 49 years on I still play table tennis. These days, and for the last 42 years, I play in the Devizes and District League. I don’t win all that many games, but I still enjoy it. 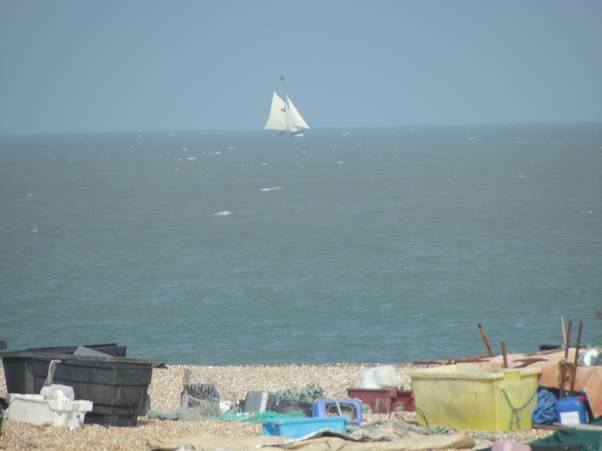 A couple of years ago I described Dungeness as a nerd’s delight so no wonder, when we holidayed in Sussex a couple of months ago we took the opportunity to nip into Kent and look at Dungeness again. It is, in my mind, akin to visiting another planet in places, but with familiarity elsewhere. Let’s start with the familiar. 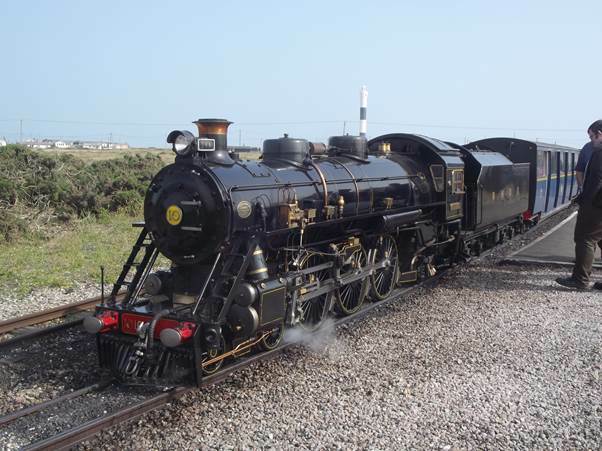 Yes, it’s the Romney, Hythe and Dymchurch Railway, the rather odd very narrow gauge line which carries passengers along quite a stretch of Kent Coast, actually from Hythe all the way to Dungeness. 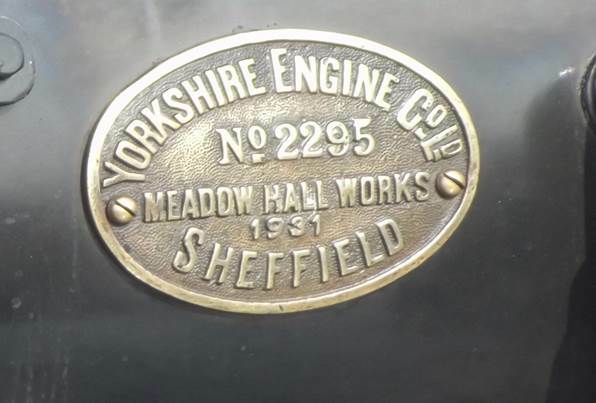 It is powered by now quite elderly steamers. This Canadian style one has the name of Doctor Syn. And we can see from the people on the right that the loco is miniature. We can also see the 1960s built lighthouse above the loco. Doctor Syn, we can see, dates from 1931. 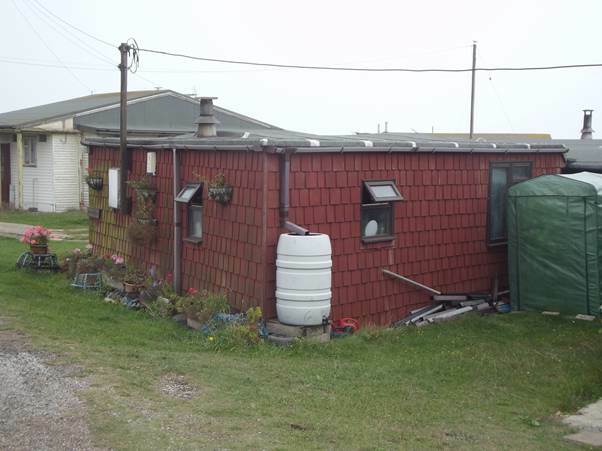 People live at Dungeness – a place where planning seems to allow all sorts of weird and wonderful little dwellings. 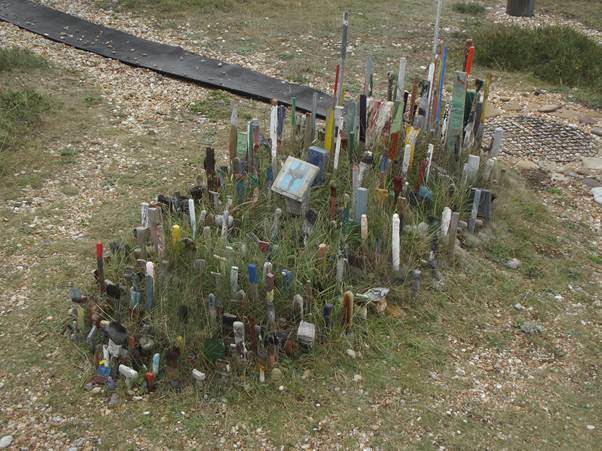 Gardening isn’t always easy on shingle so here we see a stick garden. 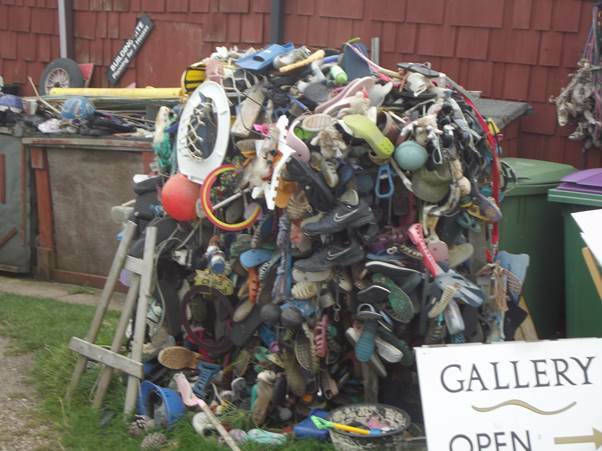 And why not use detritus washed up on the shore to make a work of art. 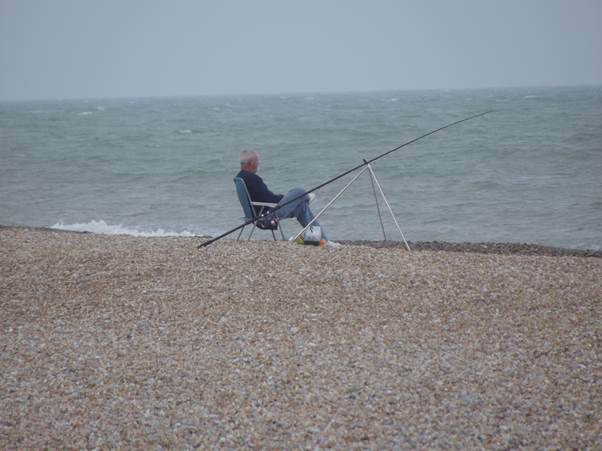 Dungeness is a good place to sit and watch the sea, with just an outside chance of catching lunch. Others just cruise past on their swish yachts. Well perhaps that is the more familiar stuff. We’ll move to the really delightful area on another occasion.